When a simple beam is loaded, there is always compression in the topmost fibers and tension in the bottommost fibers. There must, therefore, be a certain position in the cross-section at which the fibers are neither in compression nor tension - that is, they are neutral; hence the position of these neutral fibers is called the neutral axis of the section. 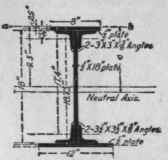 The neutral axis of a beam section passes through the center of gravity of the section, and at right angles to the direction in which the loads act. If the section of the beam is symmetrical its axis of symmetry will be a neutral axis, provided it is perpendicular to the line of action of the loads. By finding the center of gravity of a cardboard pattern, the neutral axis of any section may be located. For simple sections, such as rectangles, triangles, etc., the required neutral axis is found by the foregoing principles. When, however, the section is made up of combinations of rectangles, etc., as in Fig. 3, the distance c of the neutral axis from any line or origin of moments (usually taken at an edge of the section) may be calculated as follows: Rule. - Find the sum of the products of the area of each elementary section multiplied by the perpendicular distance between its center of gravity and the line or origin of moments; divide this sum by the total area of the figure; the result will give the required distance c.
Distance From a b to Center of Gravity. * For areas, see table, page 85. For decimal equivalents of fractions of inches, see page 53. † See table, page 85. Therefore, distance c of neutral axis (and center of gravity) from ab = 348.39 / 34.08 = 10.22 in. By finding another neutral axis in similar manner, the intersection of the two axes will be the center of gravity of the section. If the section, as in Fig. 4, is symmetrical about a vertical axis, the intersection of this axis and the neutral axis will be the center of gravity.